This summer has been a wild ride. It has rained almost every day. The sun barely has time to come out before another storm is passing by the area. Seriously, it has not felt like summer some days. Not only do you need a jacket to walk outside in the morning, but by late day temperatures are hardly into the 70’s. Sure, our AC units are not cranking away as much as we may need them and the humidity has not been up to the usual pea soup. Still, it would be nice to be able to go outside more and let the boys have fun during this so called summer. 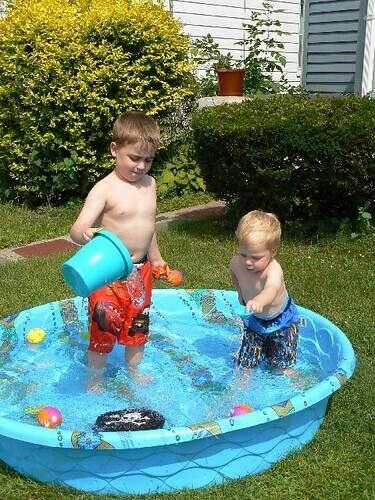 Today the sun actually came out and it was warm enough to take out the kiddie pool for the boys to play in. NHL had gone in it the other day while JSL was napping. 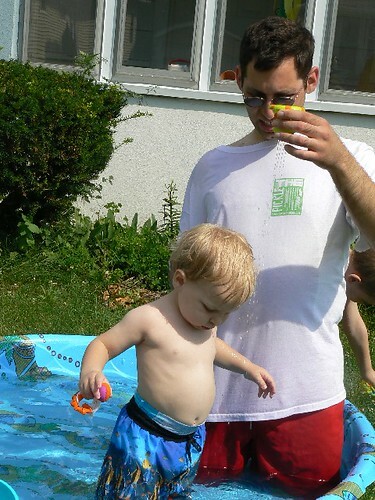 Today, we made a point to try to keep the little guy awake to go in the pool for some fun in the sun. When we got home from some errands, JL got the pool ready. 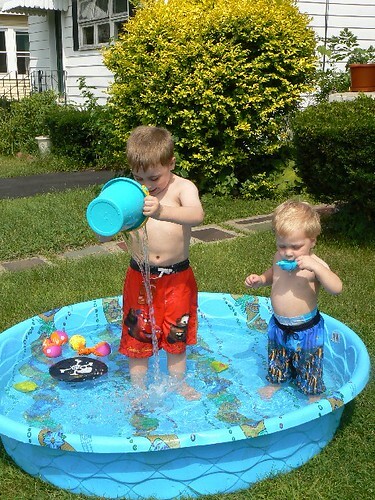 Meanwhile, I took the boys into the house to get them in their bathing suits and sun lotion. The water was quite cool from the hose. My toes decided they were not going in, so I was the designated photographer of the fun. 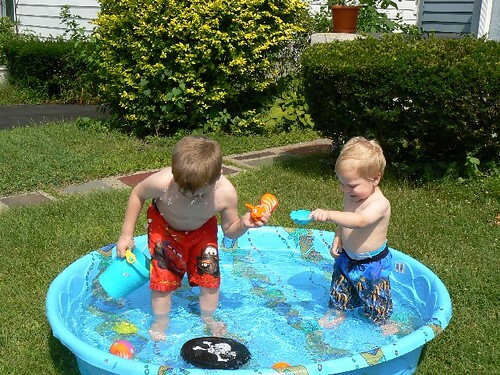 At first, the boys just had fun playing with the water and watching it. 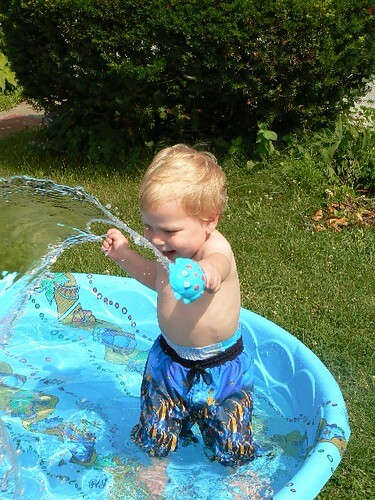 Then the little guy decided to try to splash his big brother. Not a really smart thing to do considering NHL had the much larger bucket, but what can you do? Clearly, JSL will learn since he is only two. 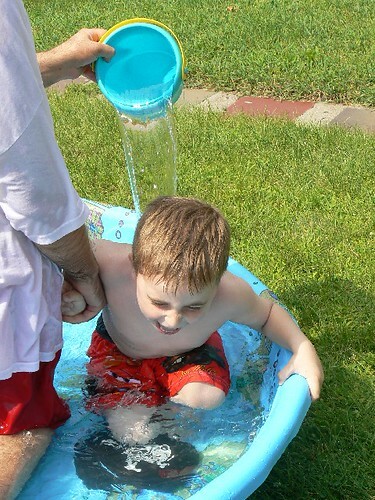 Of course, another thing the little guy needs to learn is NOT to drink pool water. ICK! Who knows what was in that sucker in reality. Oh, and the more we told him not to. . . it became a game. Soon, JSL learned how to maximize his water spray to make more fun water displays. The really big kid had fun playing with the boys in the pool. Of course, he decided to rain on JSL’s parade. 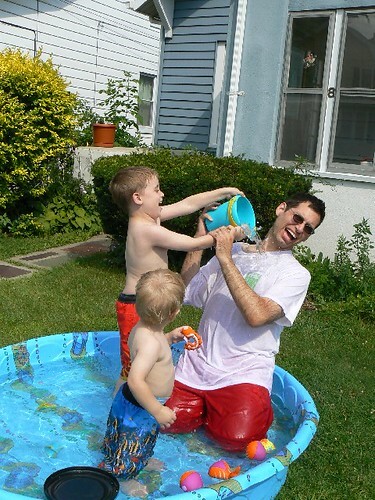 Soon, both of the boys were ganging up on JL and getting him soaked. NHL had the easiest job of this thanks to the big buckets of cold water! After a few too many buckets from NHL, JL decided to get NHL back. I don’t think he was completely expecting this. 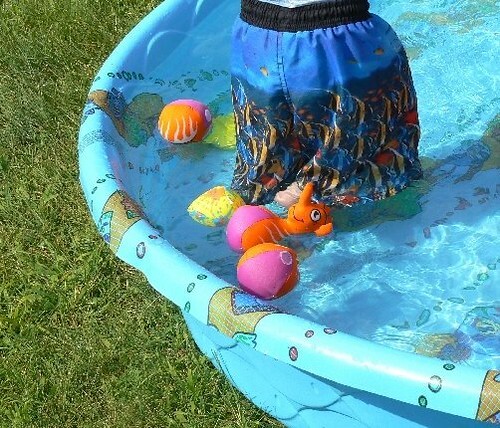 A special thanks to Mimi for the fun new pool toy that the boys enjoyed. All three of my boys had a fun time soaking in the sun rays for several hours in our front yard. With any luck, this will not be yet another tease from Mother Nature. phyllis’s last blog post..It’s a Big Day….and I’m Going!